Dezcal is non toxic, biodegradable, and a safe descaler. For fast and effective descaling of boilers, tanks, and heating elements. Original formula 1 oz pack. Add 1 oz (28 g) of powder for each 16 oz (500 ml) of hot water. Stir to dissolve. Hold solution in vessel for up to 30 minutes. Rinse all parts thoroughly. Use 1 oz (28g) of powder for each 32 oz (1 L) of water. Turn machine on and begin the brew cycle. Rinse all parts and repeat with clean water twice. 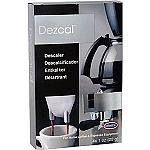 Dezcal Activated Scale Remover is specifically formulated to quickly and effectively descale the hot water tanks and components of coffee and espresso machinery. By removing mineral deposits which clog and impair brewing equipment, Dezcal allows machines to perform at optimal levels. Non-toxic and bio-degradable, Dezcal is suitable for use by both professional technicians and home users alike. When used on commercial and "closed system" brewers (with a holding tank), special attention should be paid to rinsing.